As soon as you create a financial plan, it will likely be outdated the following day. Hence, this is not a reason to avoid completing a plan. I give a nod to our servicemen and military. They prepare each day and then prepare some more for things that may never happen. In fact, it is likely that they never face the conflict that is planned for. However, all that planning prepares our military for what will possibly happen. This is the benefit of creating a financial plan. By going through the process, you will learn the levers to pull or not to pull, which will guide your way through retirement. 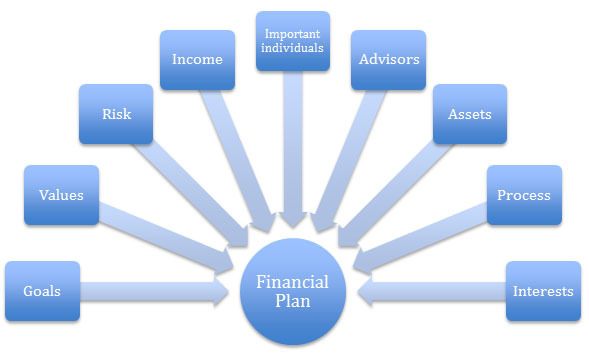 When I was working with individuals in Denver and Colorado Springs, I found that it is helpful to use visuals to understand the things to consider about in a financial planning. Typically, people think of income and assets as being the most important pieces of the plan. While we need these to create a plan, they are just two of nine parts that are important. In fact, the more important parts are understanding goals and values. I like drawing this out for clients because it helps me remember all the components and it helps individuals visualize what our process is and what it would mean to create a successful plan. Working for 40 or more years, people often have a cause or a purpose they want to fulfill. An individual’s goals are one of the two most important parts of a plan. If your plan does not help you fulfill your goals, then the financial plan does not fulfill your needs, even if it is providing for food and shelter. Regardless of what is important to you, whether it is giving to your children, charities or the church, your values are needed to fulfill the plan you create. An individual’s willingness to take risk means different things to different people. Some think of it as volatility, whilst others think of it as a loss of value, which is known as the “maximum drawdown”. Even if others think of risk as a complete loss of value, you should define risk because it is good to incorporate your definition of risk into the plan. The revenue you receive in retirement can come from social security, pension, ownership in a business or a farm or if lucky enough, an allowance. The important part is determining how much you will have as income from these sources and how much your other investment accounts will be needing to provide income and for how long. Your spouse, partner, significant other, kids and grandkids are important individuals. It may or may not be important to care for them. If it is significant to care for important individuals in your life, then it is essential to incorporate this into your financial plan. Having people on your side can benefit you. Experts in taxes, accounting, estates, insurance and the law are important. Even more important is getting each of those advisors to work together so that they will be beneficial to your overall plan. The assets you own can create the income you need to fulfill your goals. Some assets are better prepared than others to get you through retirement. If you are like me, you like opening up the hood of the car and seeing how it all works. You appreciate communication and learning the process. Consequently, it is important to understand what you appreciate, what is important for you to know and how you want to work with others. You have worked hard in the last 40 years to enjoy your hobbies. Now in retirement, you have more time for your own interests. The question for your plan is what will you need in the way of assets and income to make sure you are able to enjoy your interests. Creating a plan is more about your goals and values than just about your assets and income. When you focus on all the components above, the plan will be more meaningful and will have a longer shelf life compared to if you are just thinking about the income you will need.